To show us how to really deck the halls, we gave the talented designer a challenge. 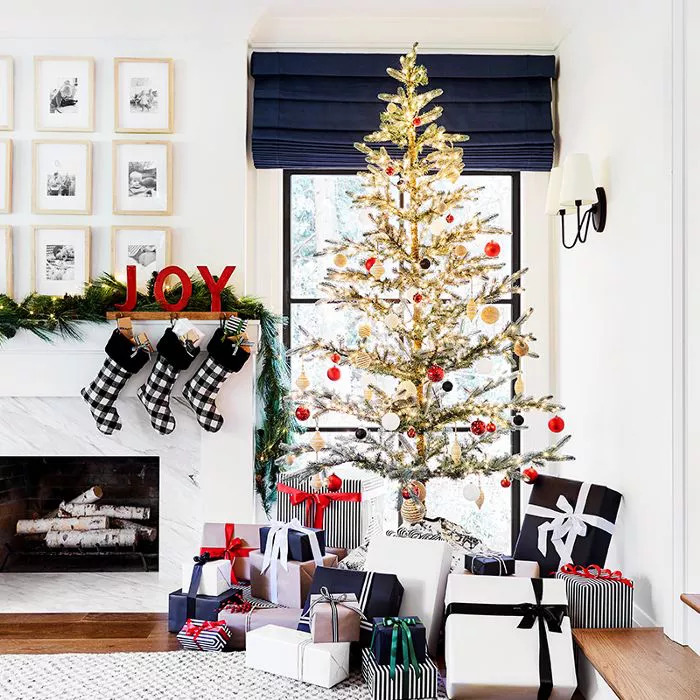 We asked Henderson to show us exactly how she'd decorate her entire home—from the entryway to the dining room—for the holidays using only products from Target and with a budget of only $100 per room. As expected, she did not disappoint. In fact, we predict that you're going to want to add every item to your cart. (By the way, if you did, would only set you back $400). 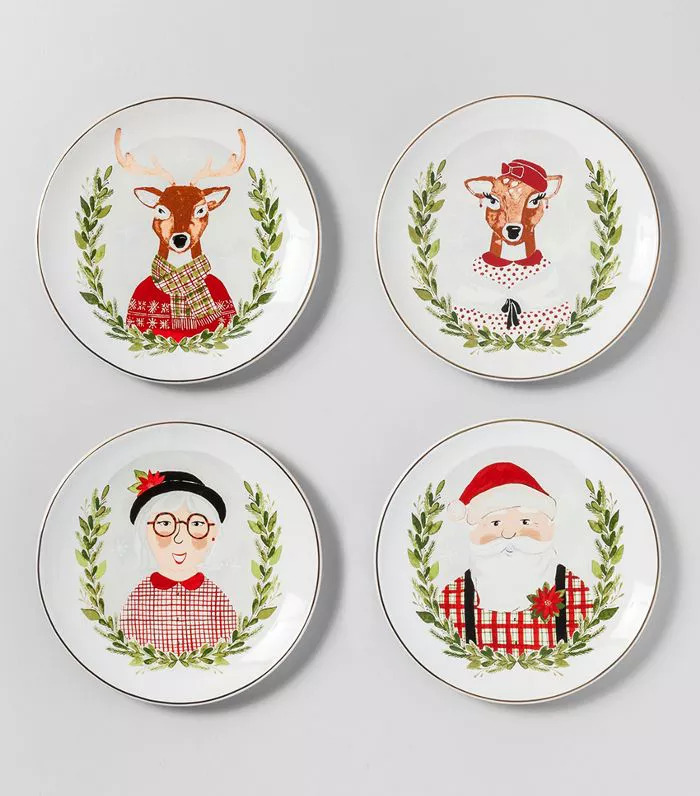 Keep scrolling to shop Emily Henderson's affordable Target holiday home décor picks. 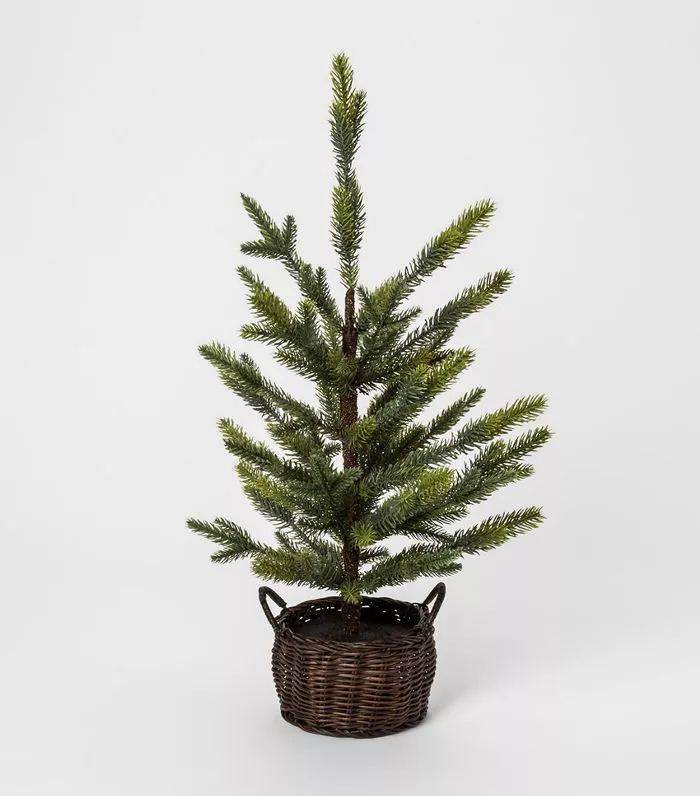 "I use greenery as an anchor in just about every space I decorate for the holidays: the Christmas tree, wreaths, garland, and more. 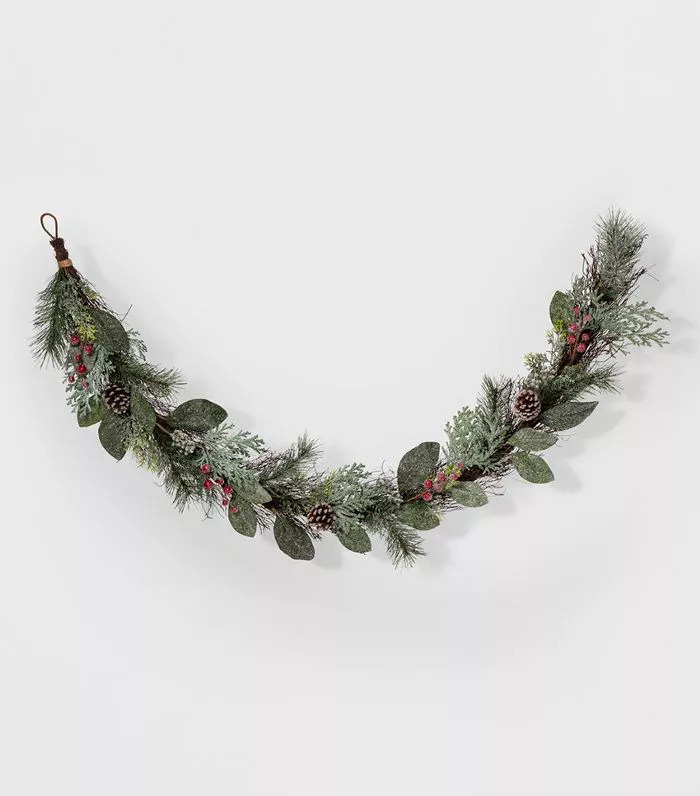 I love draping this faux garland over my staircase, as it's the first thing you see when you walk into our home and it instantly puts everyone in the Christmas spirit. It also means easy cleanup and no fallen greenery or pine needles on the steps." "Last year was the first year that I used these on our tree versus the traditional plug-in Christmas lights, and I am a convert. 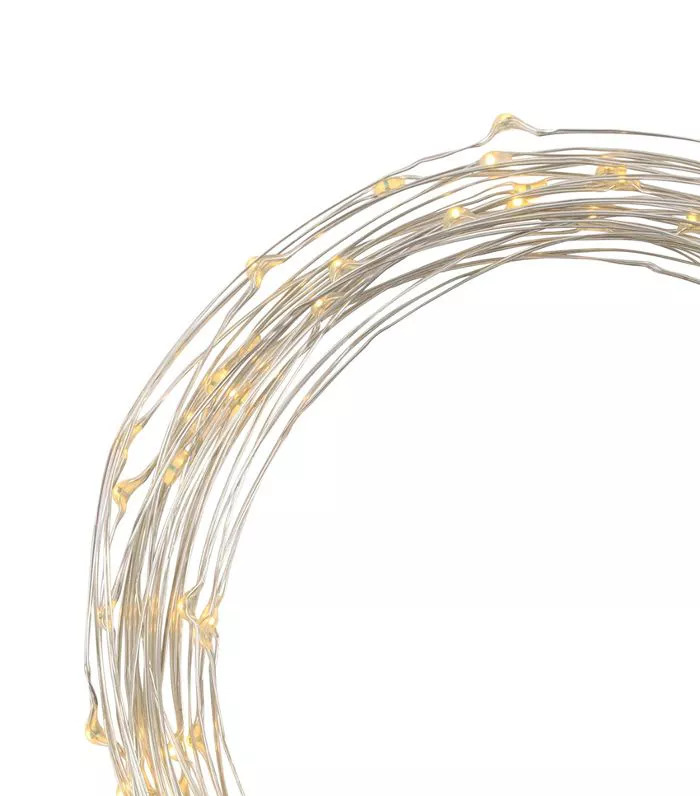 I'm all about easy, efficient solutions for the holidays, and these fairy lights come with a battery pack, so no need to buy plug-in lights anymore. The thin wires also allow you to easily wrap them just about anywhere without having to worry about hiding the cords." "One of my favorite styling tricks is to wrap presents in a specific color palette. Choose wrapping paper, bows and gift tags in the same color scheme and scatter the gifts throughout your home to create a cohesive theme." "Holiday doesn't necessarily have to mean red and green and iconic holiday elements decking the halls. I love bringing in knit and chunky textiles like this blanket during the winter months to warm up the space and create a cozy layer. Because it doesn't scream holiday, it is also something that you can use year-round after you clear out all the other holiday decor." 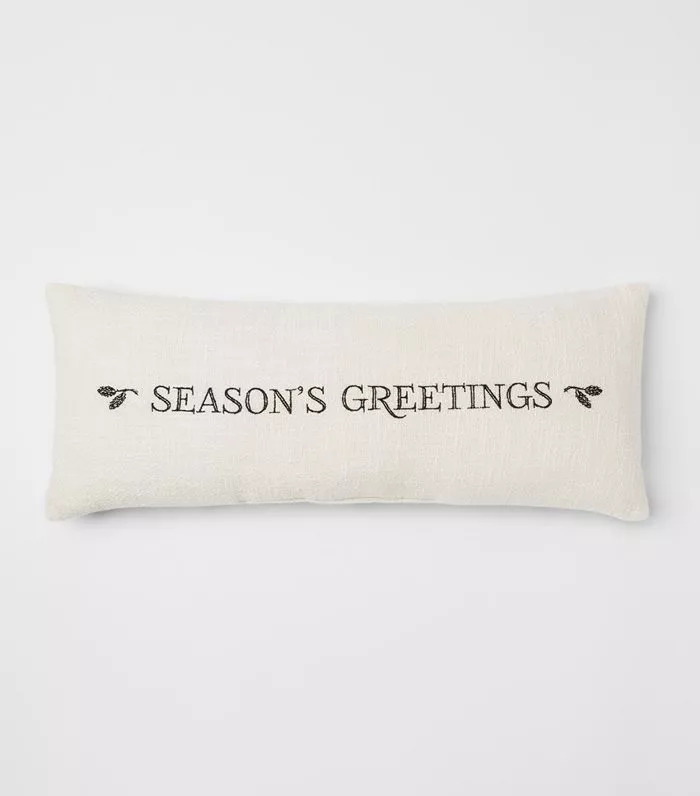 "I'm all about the refined-traditional look this holiday season, and this pillow adds a festive touch to any living room without being over the top. The holiday pillow is a thing, and I am very into it this year, especially when done in a timeless and neutral way like this one." "I love pieces that can make a big impact with little work required. This is one of those pieces. 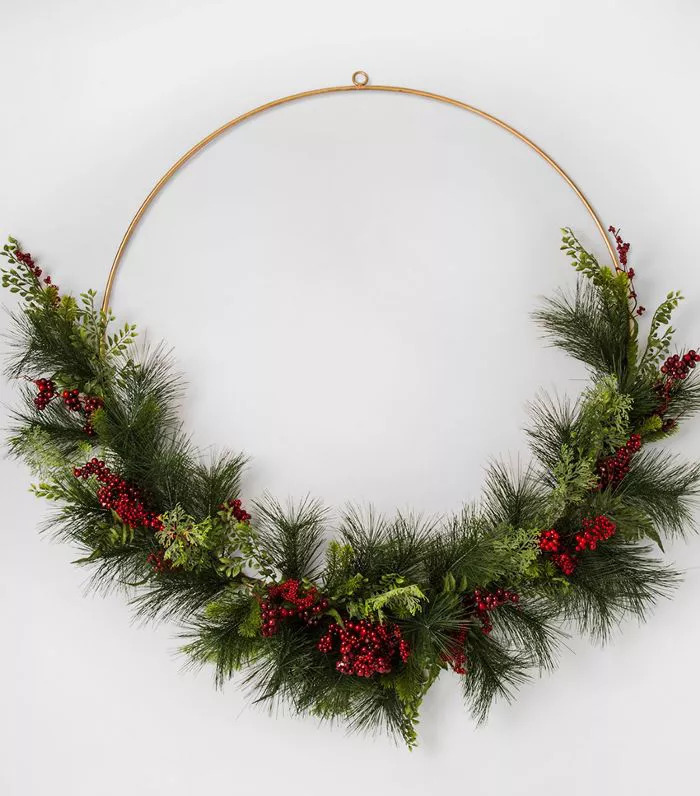 I love this wreath because it's a modern twist on a holiday classic. Plus, its oversize scale makes it a great statement piece." Hot tip: "If you're worried about the size of an item, try using Target's , which allows you to browse through items from rugs and sofas to wall hangings and decorative throws—and see them styled in a curated space. It takes the guesswork out of visualizing size and is so easy." 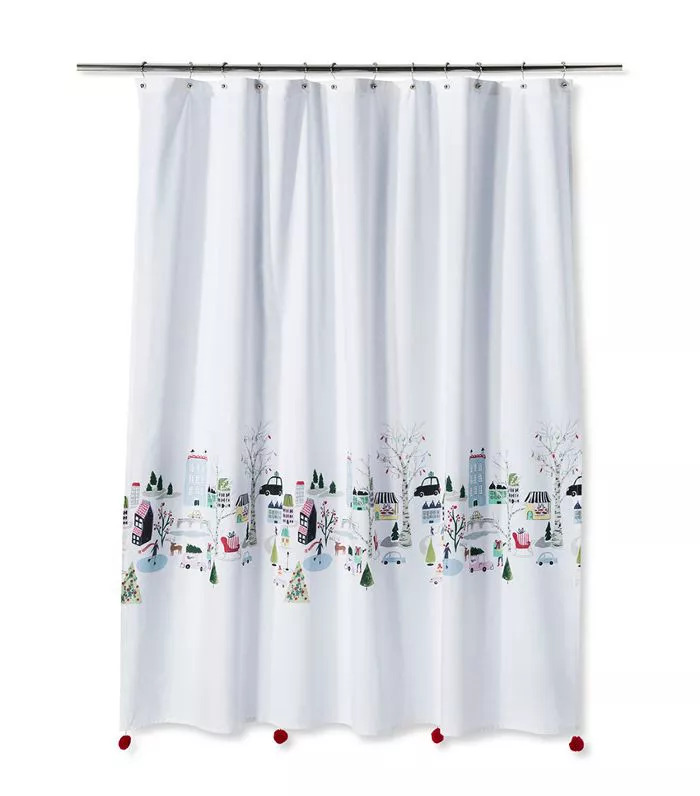 "The secret to getting that updated traditional look is to pair red and green moments with a lot of neutrals—think whites and blacks to add sophistication. 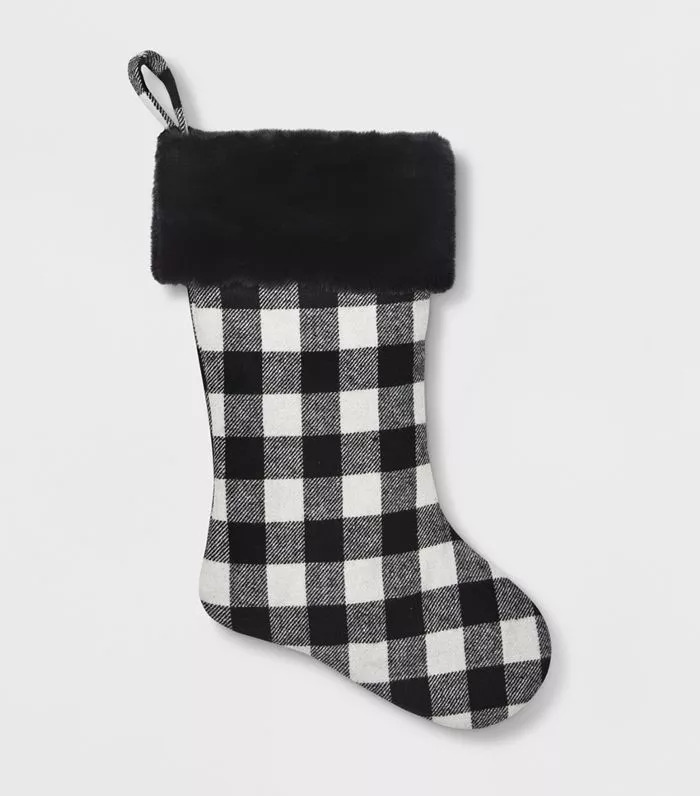 These stockings help to bring in some neutral colors while keeping it modern." 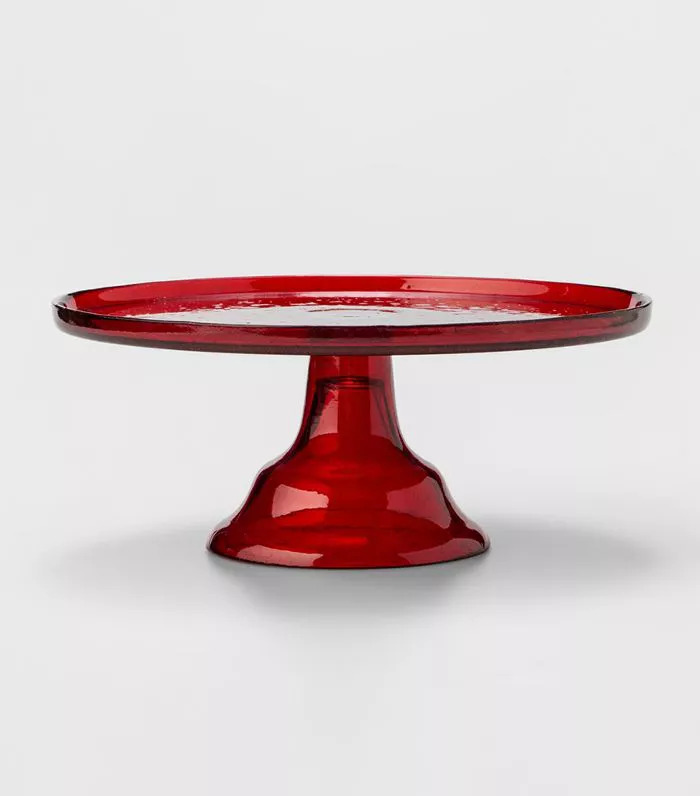 "Elevating your homemade (read: store-bought) confections just got a whole lot easier with this beautiful cake stand. The added height also allows you to layer it on your tabletop without having to sacrifice space." 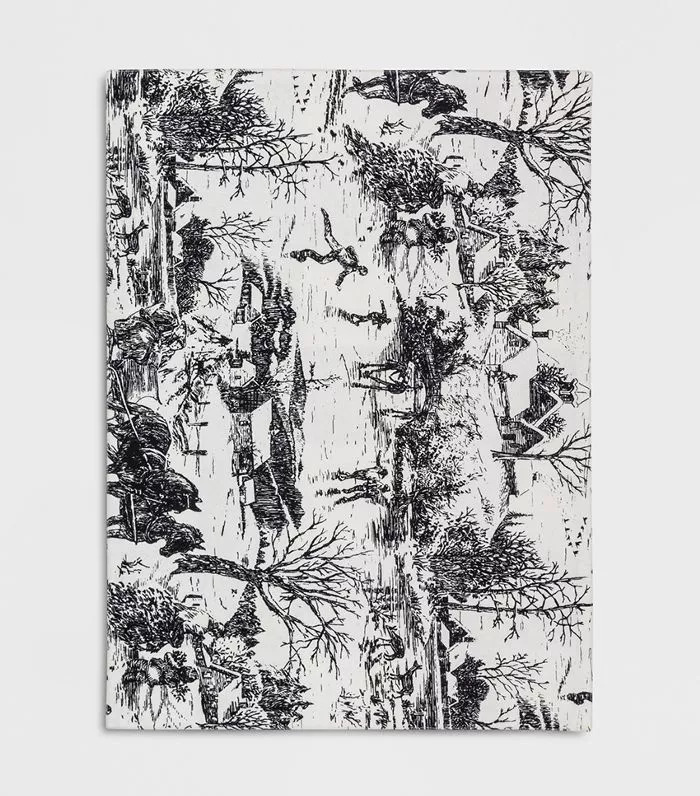 "Toile is a pattern that I have always loved, and it is making a major comeback this year in the holiday section. The black-and-white color palette helps to keep it feeling a little modern, and when you are ready to switch it up it is reversible to a plaid print." 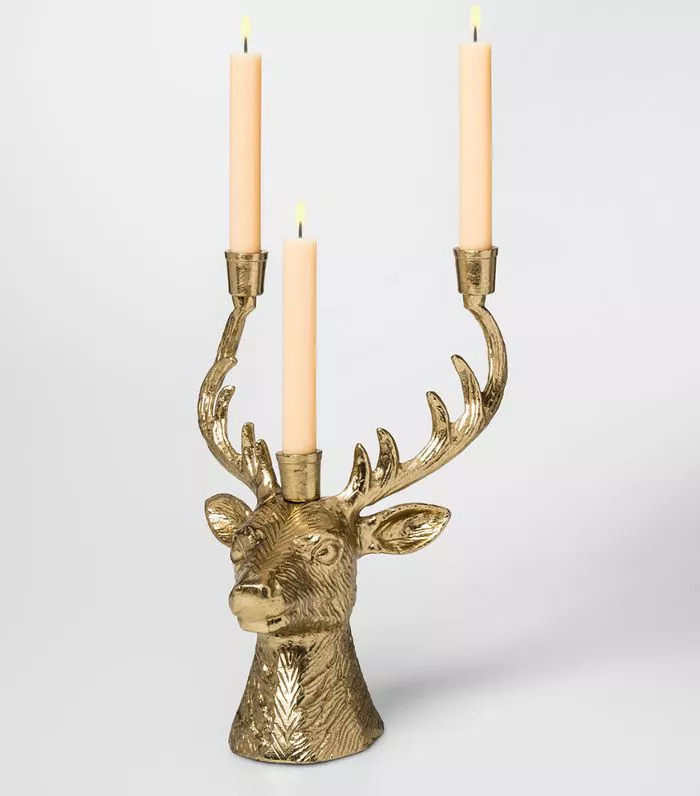 "This reindeer taper holder is the perfect accessory for any little corner, but I would love using it on a bar cart or as a centerpiece for a holiday table." 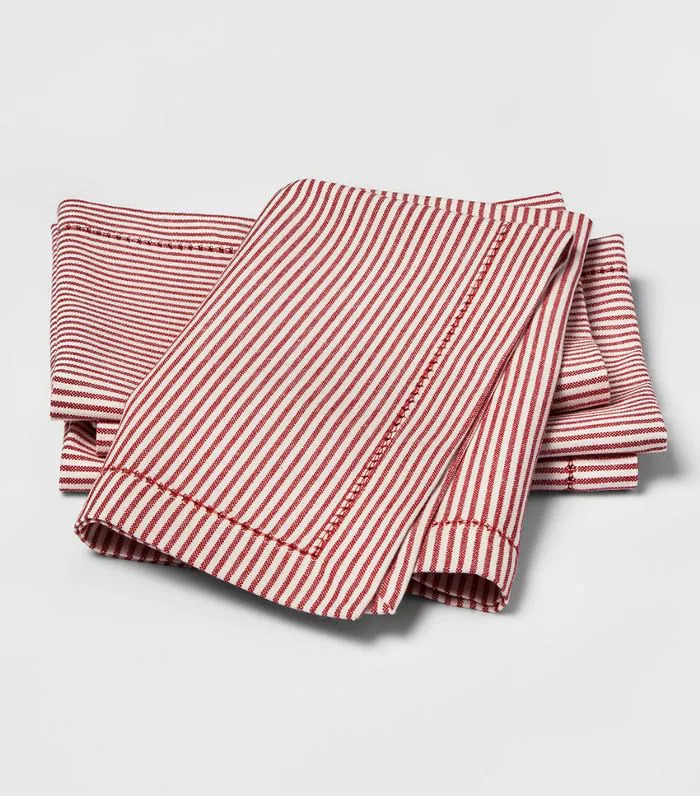 "I love a ticking stripe, and this red-and-white version is perfect to bring the classic pattern into your table décor in an easy way. Mix it with the black-and-white toile placemats and some greenery, and your table is ready to go." 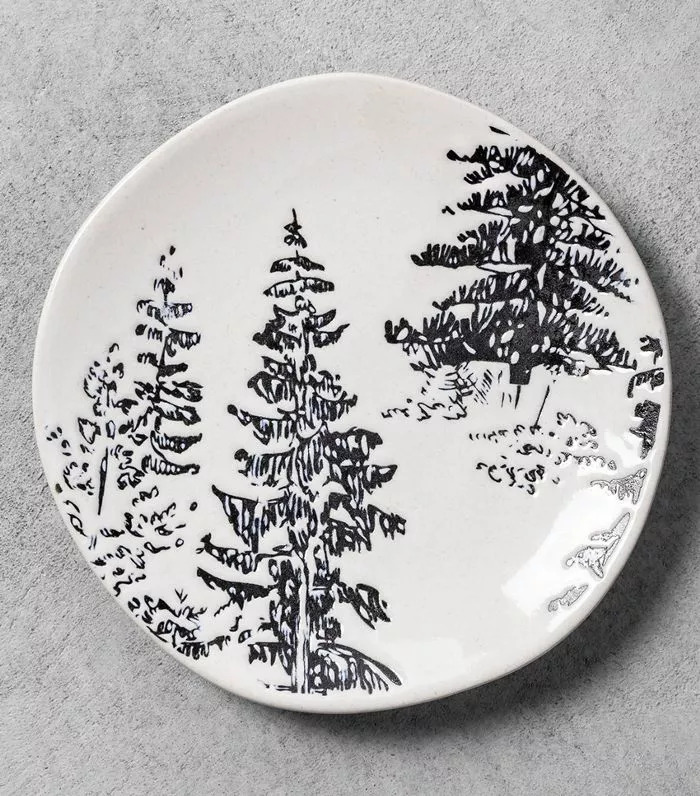 "I love these appetizer plates as they can be layered on top of a basic white dinner plate to create the perfect festive look." 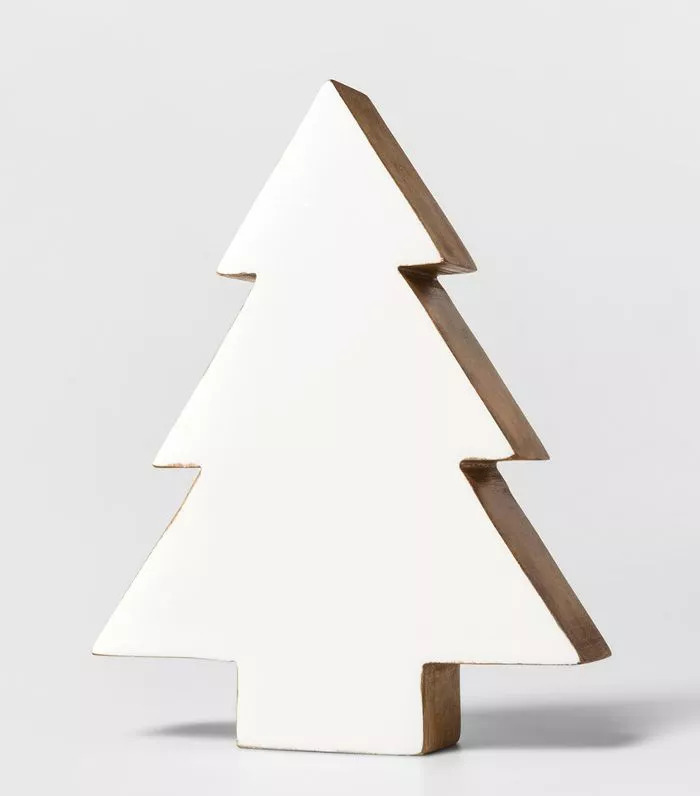 "A little holiday décor can go a long way in the kitchen, and these simple trees are something that I would love on hand. They are easy to style (just a few grouped together, and you are done) and they are reversible with wood on one side and white on the other." 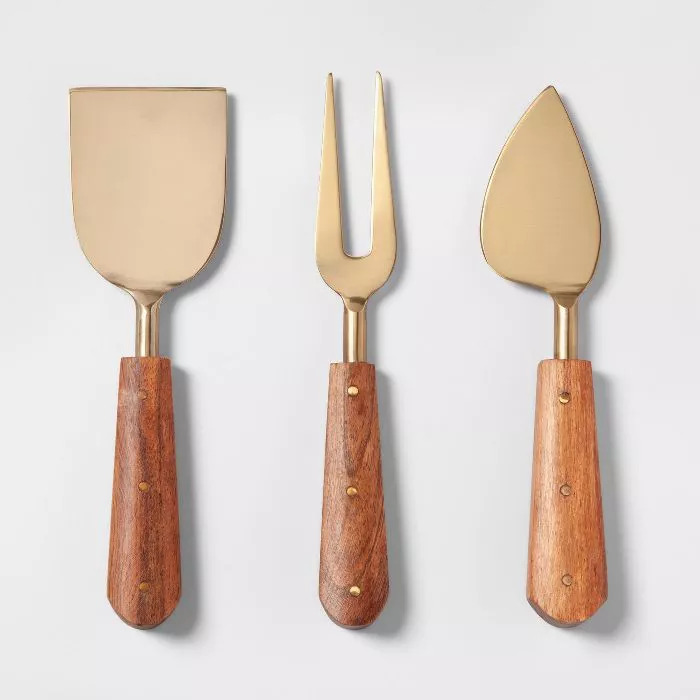 "The holiday cheeseboard is something that I am still perfecting, but this set is guaranteed to dress up any selection of cheeses you put out for your guests." 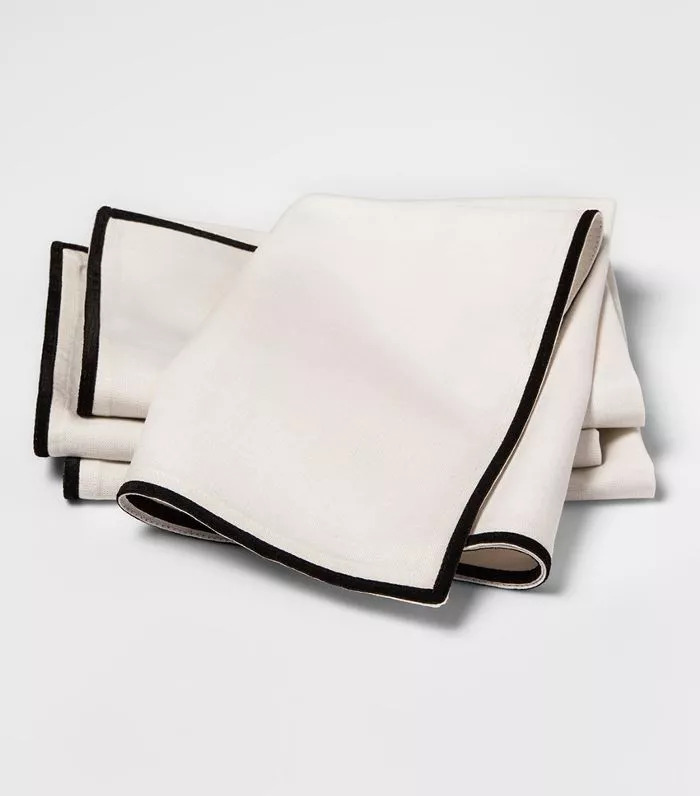 "Black and white is a combo that I will never tire of in my home, and these simple yet refined napkins (complete with velvet trim) would make me and my kitchen very happy this holiday season." 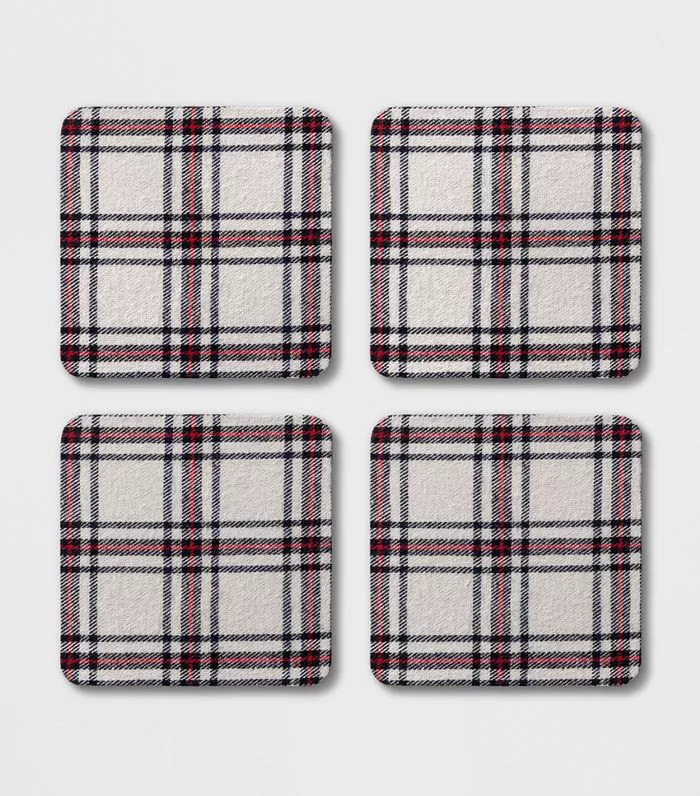 "Everyone needs a cup of hot cocoa in their hands during winter, and every cup of cocoa needs a cute little plaid coaster like these ones to keep your surfaces free of water rings and spills." "I already have these in my shopping cart at Target. I love that they read holiday but also could be used year-round. I will definitely be getting a set of these for our mountain house this holiday season." "As soon as the weather starts getting cooler, I swap out summer textiles for cozy and warm options like faux fur and knits. 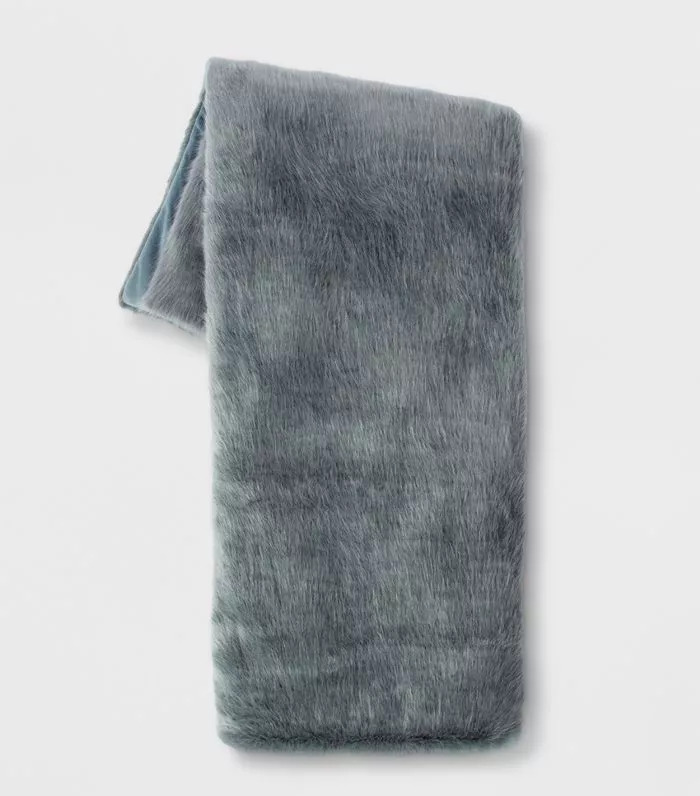 This throw adds an elegant touch." 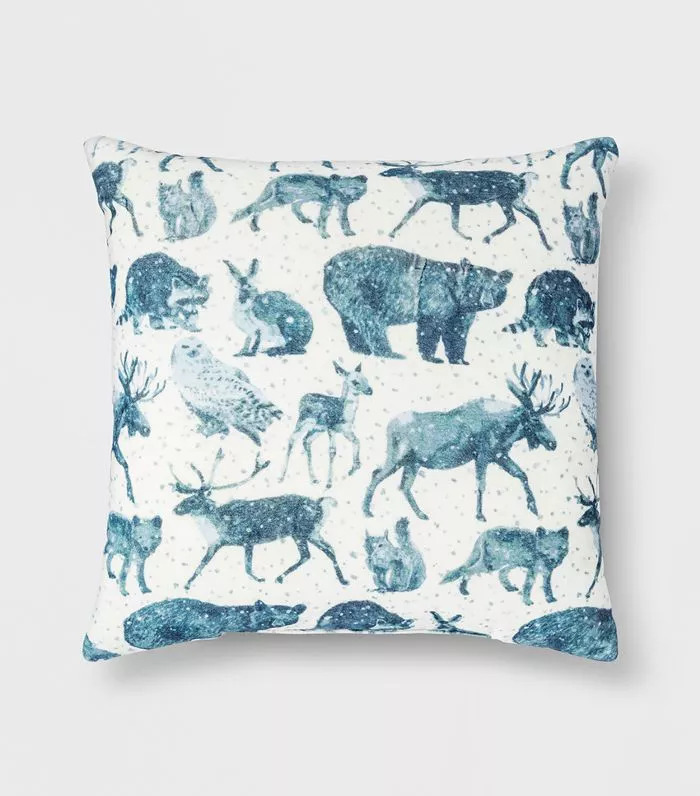 "I'm in love with the print of this pillow—when designing the latest Threshold collection, Target's design team took inspiration from old folk animal artwork and winter's soft color palette of whites and blues. The result is this charming rustic winter pillow, which I am very into." "The bedroom is an area that can often be tricky to decorate for the holidays, but I love using these faux trees on the dresser in our bedroom every year. A small collection of different sizes brings in a bit of holiday without it feeling over the top." "I always like to add a playful holiday touch in unexpected places, like the bathroom. 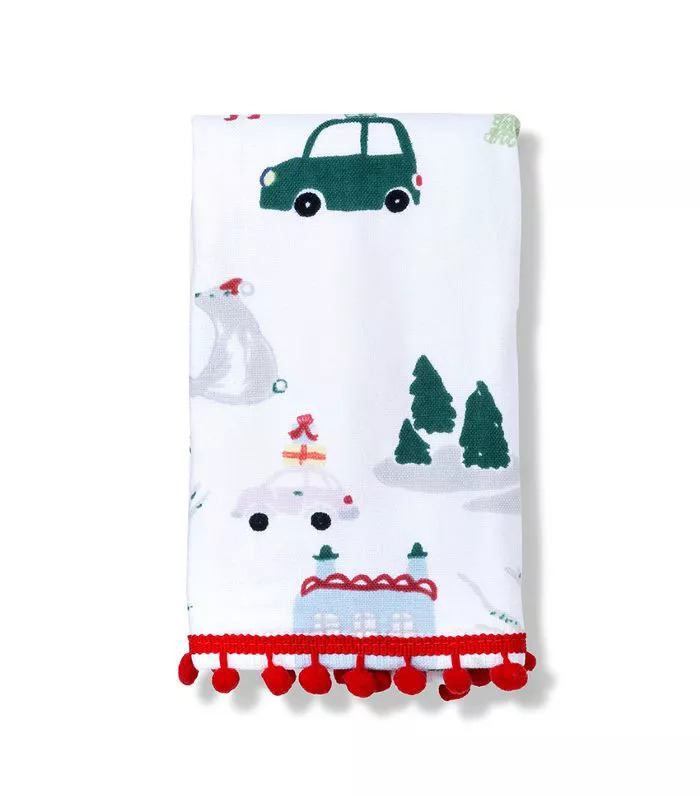 This shower curtain comes in a playful print that gives off a retro holiday nostalgia feel and a pinch of global inspiration, and this would be so fun in our kid's bathroom." "Getting my kids to take a bath, let alone wash their hands, is a challenge. 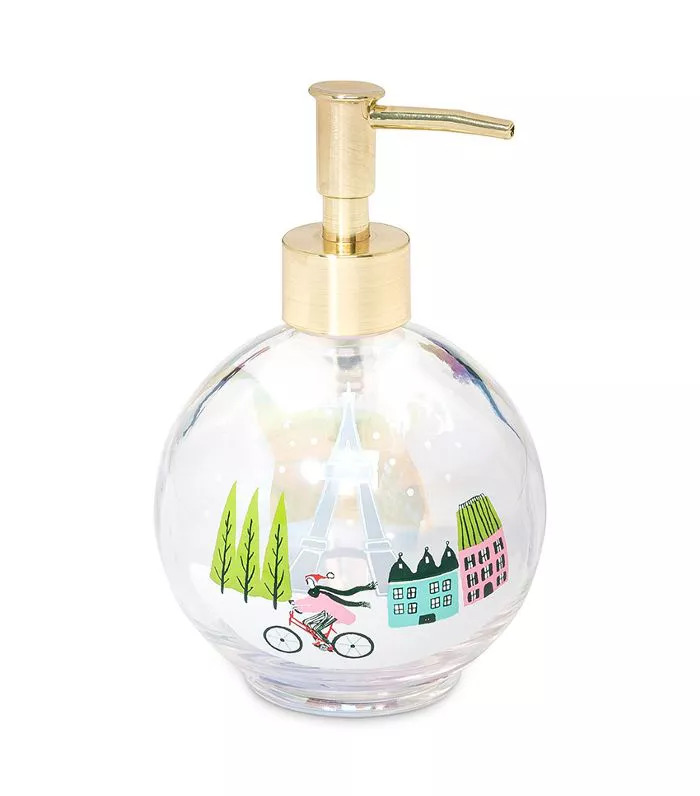 However, sprucing up their bathroom with this adorable multi-purpose soap/lotion dispenser might do the trick. 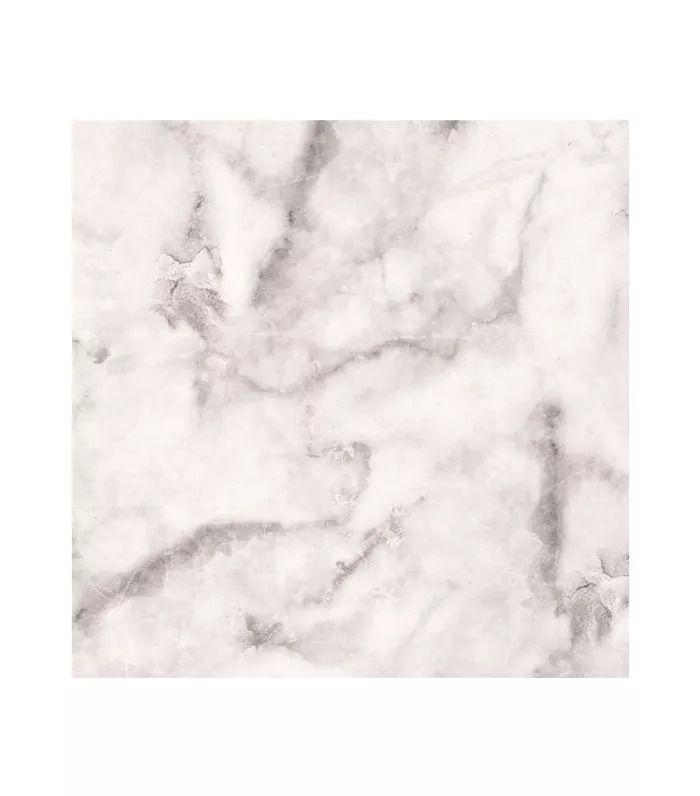 It could also be very fun in a powder bath for the holiday season." 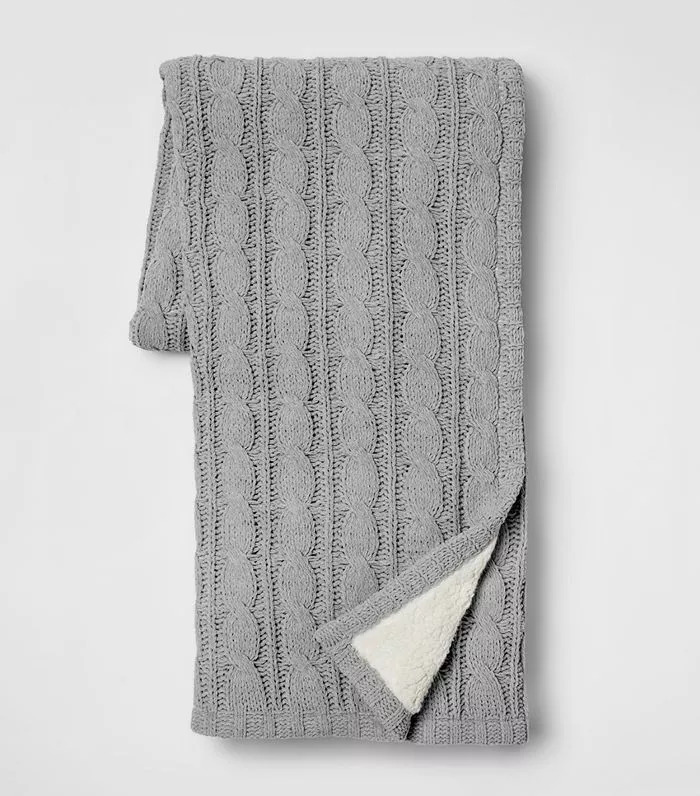 "Complete the theme with a matching hand towel in the same print!"